Remember the #AbuadBeautyClass I spoke about some posts ago? It turned out awesome!!! Quick disclaimer: some people are born with great flawless skin, some are not, and I belong to the latter group. 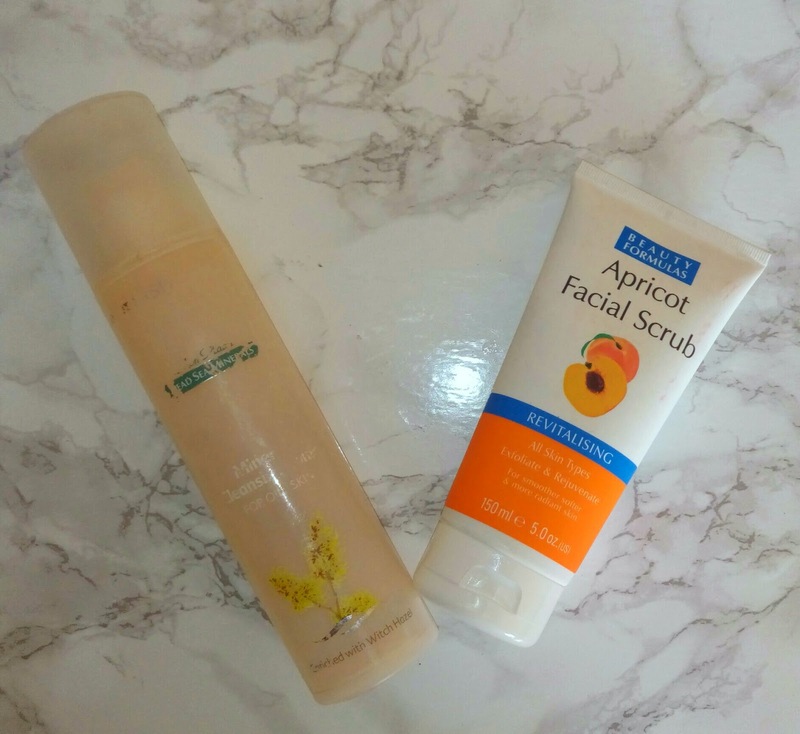 For this reason, I recently developed a skincare routine that helps with some of my skin problems which are usually oiliness in my T-zone and acne as well as enlarged pores. Skincare is a lot more important than makeup to me since I don’t ‘cake up’ on a daily basis. Therefore, I have to make sure that my skin stays radiant and well cared for. 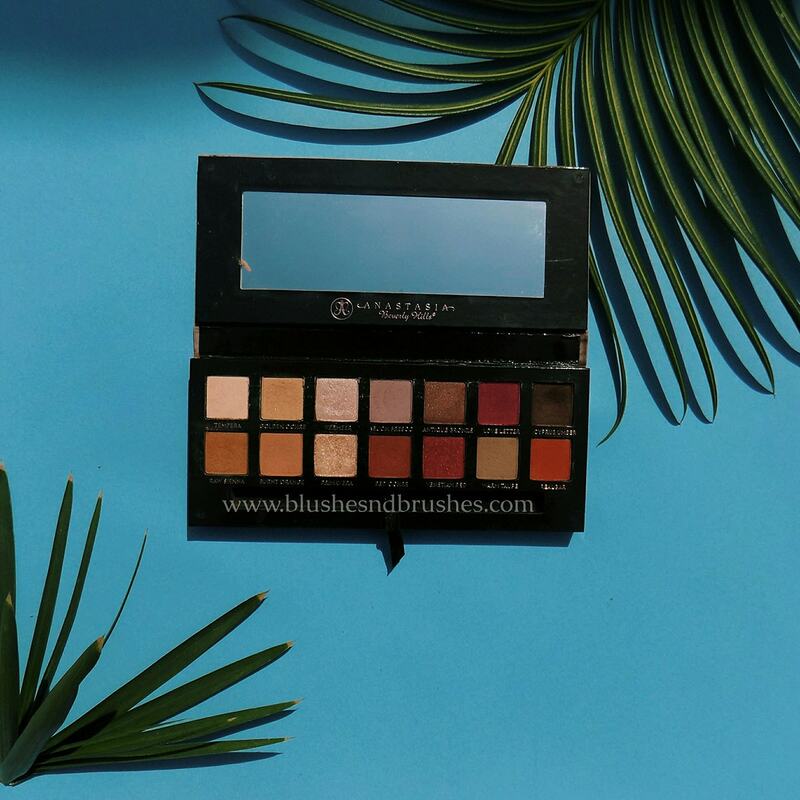 I will not be reviewing these items in this post, just listing them and telling you how I use them. If you want a more in-depth review of any of the products, just leave a comment below. 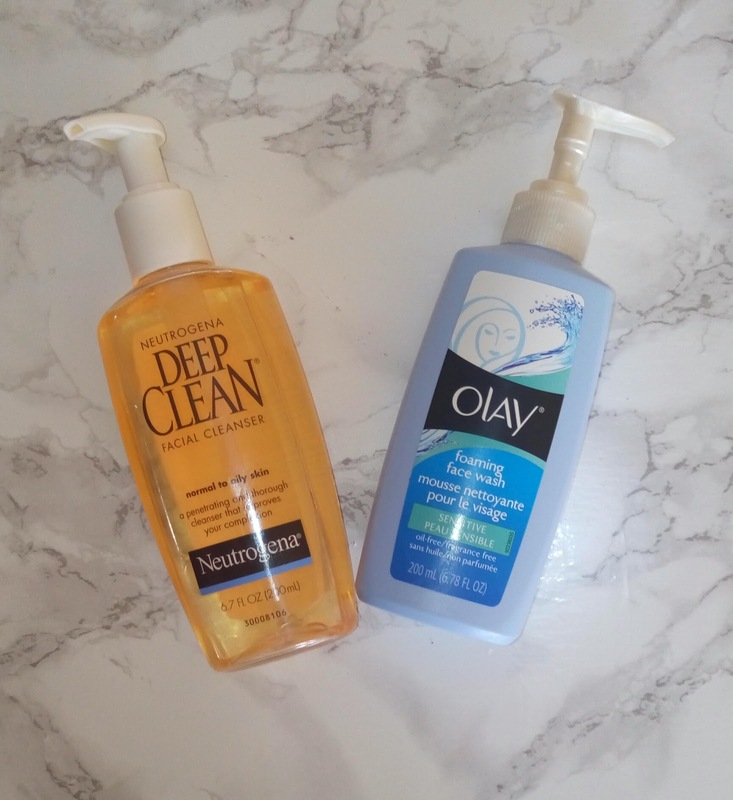 So first items are my cleansers; I currently use Neutrogena Deep Clean facial cleanser (for normal to oily skin) and Olay foaming face wash (for sensitive skin). Both of these cleansers are oil free which is great for me. I use the Neutrogena cleanser twice or thrice weekly especially when I use full face makeup because it deeply penetrates pores to dissolve makeup, oil and dirt. This cleanser has salicylic acid which treats acne (Gold point for me). I use the Olay cleanser daily (sometimes twice daily) because it is very gentle and leaves my face feeling clean but not stripped (too dry). Next are moisturizers; this is step that no one should ever miss, whether you have dry, normal or oily skin. 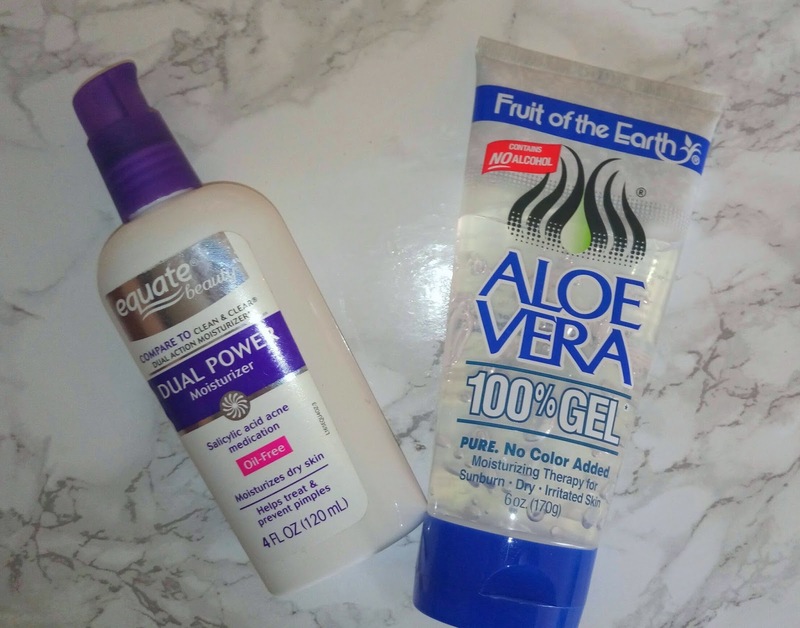 I use the Equate beauty Dual power moisturizer (contains salicylic acid) and Fruit of the Earth Aloe Vera 100% gel. Both my moisturizers are oil free, however, the Equate moisturizer still makes my face feel more oily (because it is for dry skin) so I only use it on my neck and chest where I am also acne prone, I also use it on parts of my face that are dry (I have combination skin) but not on my T-zone. I got the Aloe Vera gel on my face as a daily moisturizer (I know it is weird) but Aloe Vera has so many great benefits for skin (and hair and health lol) so I use it. Even though it is meant to heal and treat dry skin, it does not leave my face feeling oily which I love. My recent obsession is facial masks. A mask draws out toxins, dirt and impurities from the skin especially the pores as well as reducing their appearance. For someone with enlarged pores, a mask is a must and it is a great addition for the skincare routine of any other person who just wants great skin. 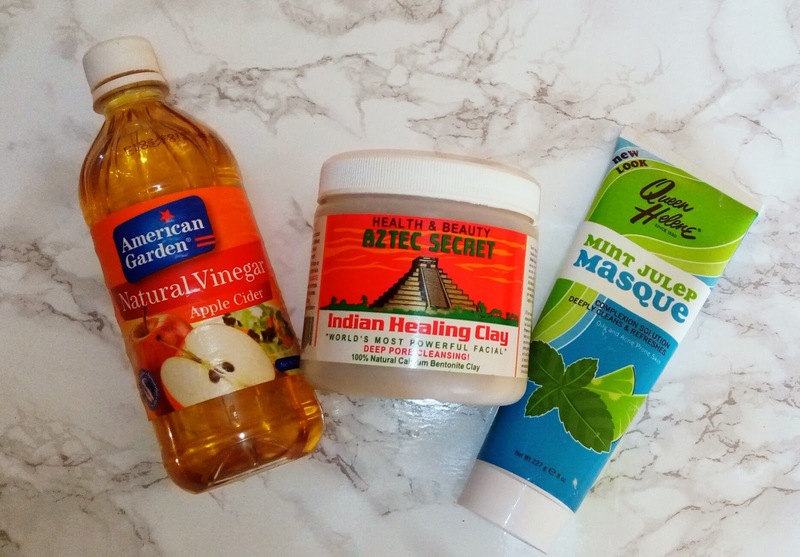 I use the Queen Helene Mint Julep Masque (for oily and acne prone skin) and Health & Beauty Aztec Secret Indian Healing Clay twice or thrice weekly. I use the Queen Helene mask more frequently because it is already mixed as a paste so it is less messy and time consuming. However, whenever I have time, I mix the Aztec clay powder and water or apple cider vinegar and use it. I love both these clays. Next, I have my toner and scrub. I use Dead Sea Minerals toner enriched with witch-hazel (for oily skin) and Beauty Formulas Apricot scrub. 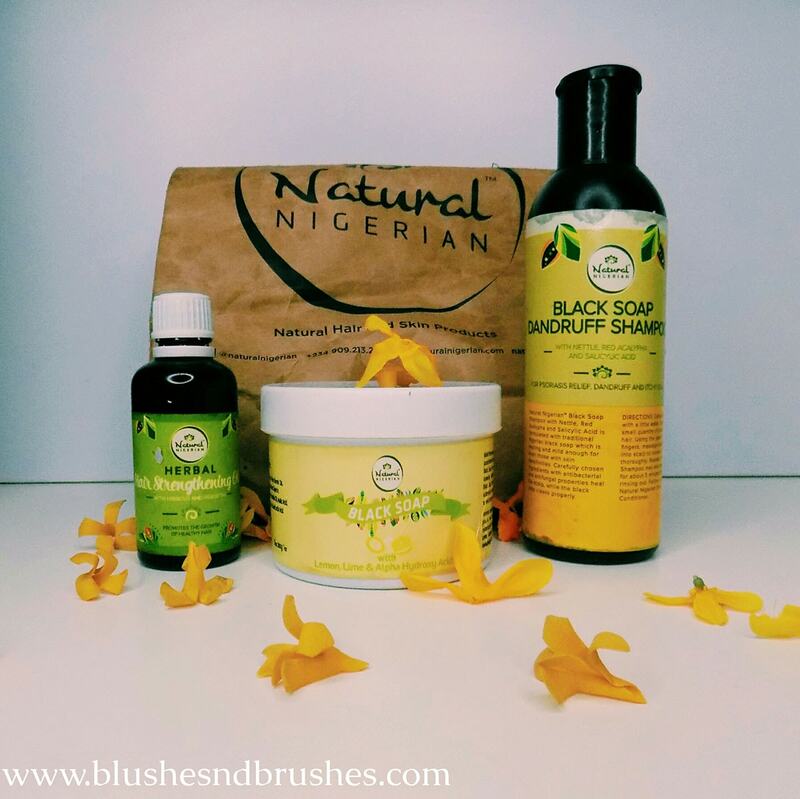 I use these products as often as I can. A toner is meant to balance out the pH level of your face as well as brighten/even complexion and also cleanse. Witch-hazel is great for acne prone as well as oily skin so I like that my toner has that. I use the scrub to exfoliate (remove dead skin cells) for a radiant looking skin. 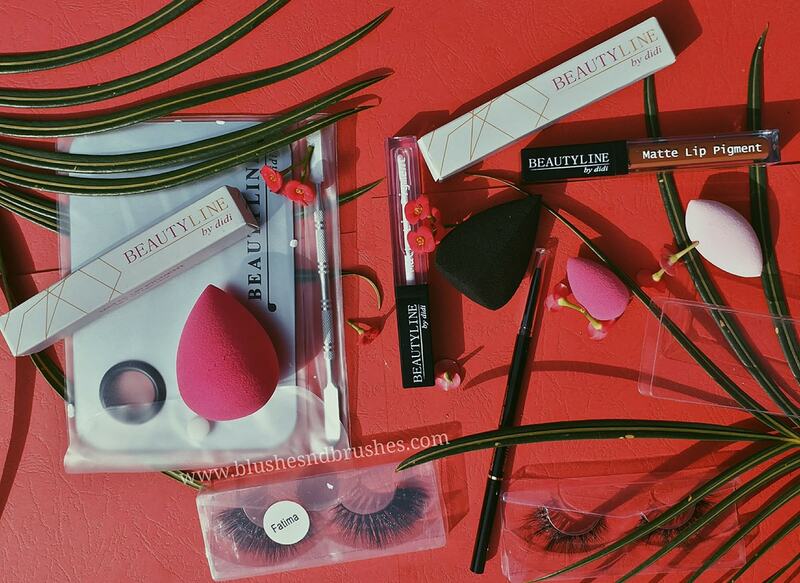 Lastly, my favorite item is the revolving face brush I got this summer. Everybody needs this in their lives. 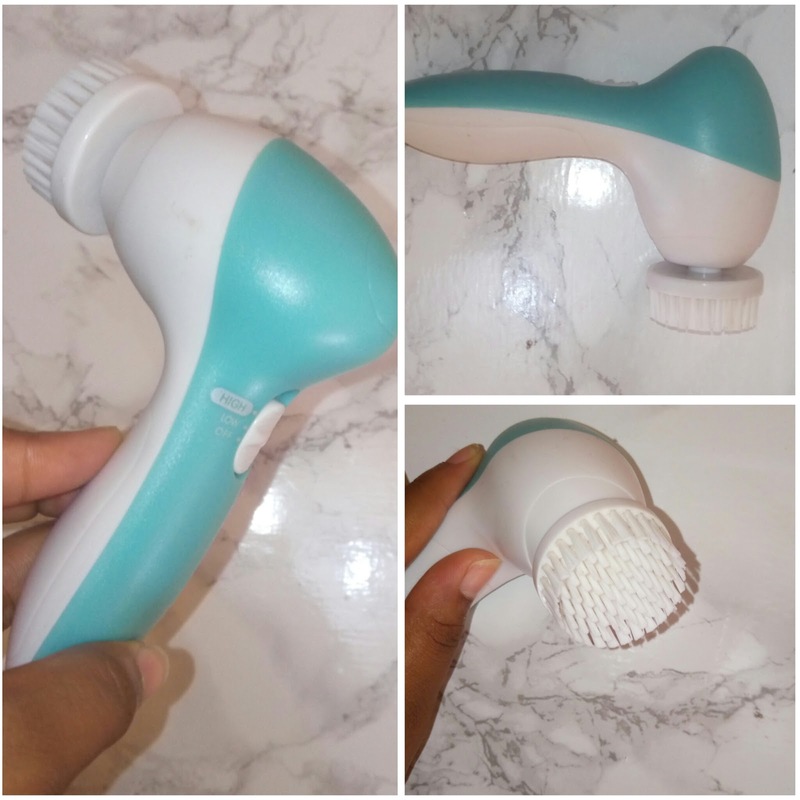 It is simply a battery operated brush with a revolving head and soft bristles that really get into pores and cleanse them thoroughly. It is also great for exfoliating. I am obsessed with this item! 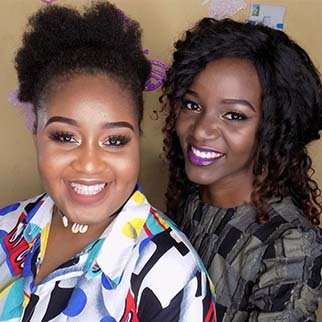 • If I am wearing makeup, I will take it off with 2/3 makeup/baby wipes and olive or coconut oil (Beauty tip: oils help break down makeup thereby making it easier to take off. They also balance out the sebum (natural oil) that the skin produces). If not, I just start with the second step. 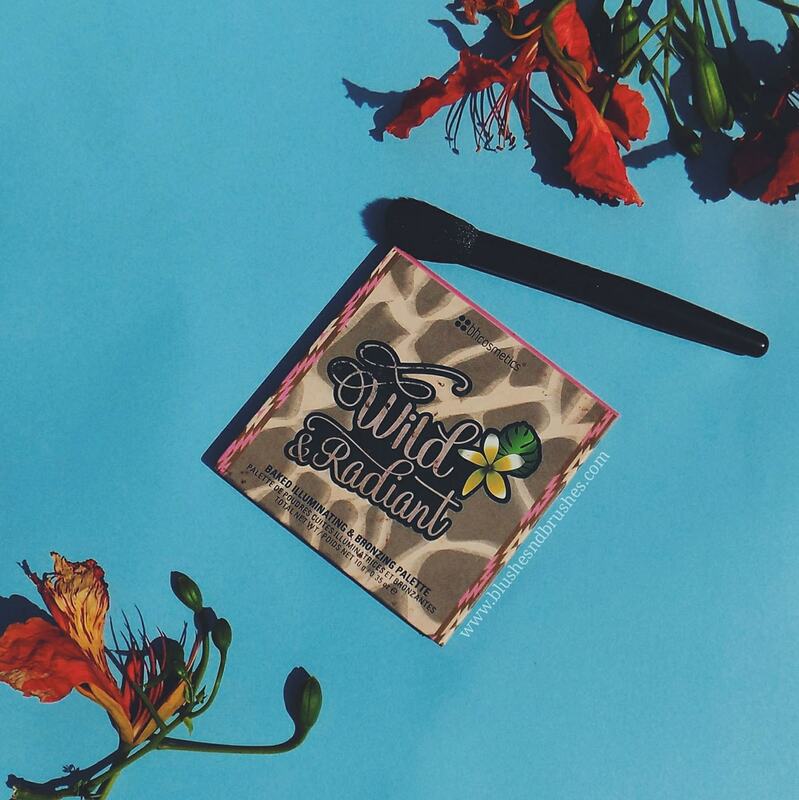 • Since my pores are open, I use a clay mask to draw out impurities, dirt and excess oil from my skin and pores. I leave the mask on for 15-20 minutes or until it is dry and I can feel my face tighten. • I then proceed to tone my face, neck and sometimes my chest area and finally, I moisturize with both moisturizers. My routine seems like a lot but immediately I got used to the pattern, it was not so bad. Since I don’t do all these steps on a daily basis, my skincare routine takes not more than 15 minutes except when I use a mask because I have to let it dry. I hope you learnt a few things from this post. If you do not have a routine, I will advise that you start with a simple routine, maybe just a cleanser and moisturizer, and then work your way up from there. Leave a comment down below if you have any questions or request. 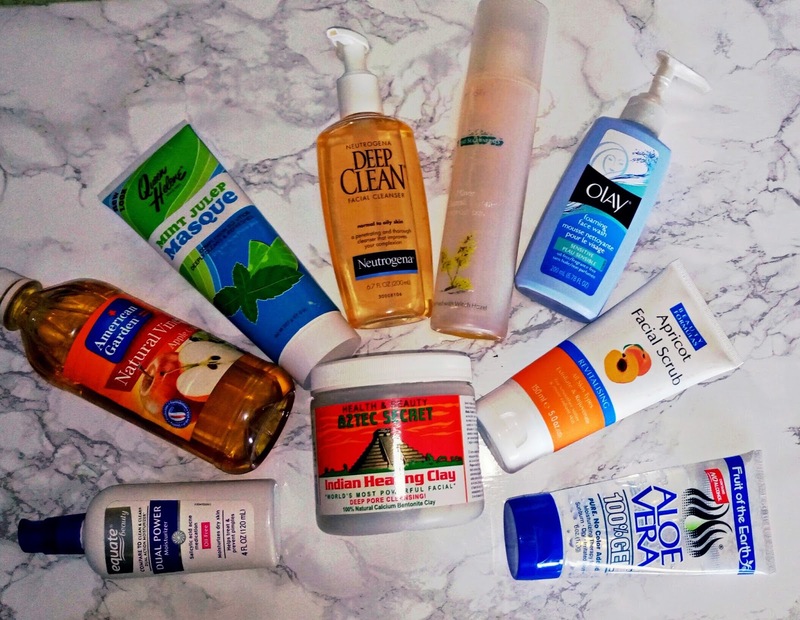 You can check out some more skincare posts here and here. Wow great routine. I have oily and acne prone skin too and large pores to go with it😔 and am really frustrated cos I don't no what to do anymore. When I use something on my face it works fine for the first 2 weeks but after that everything goes back to normal. The only thing I used that really help in skin toning was Mon platin but I stopped using it cos I thought it was suppose to clear out my face too. Its really good. I hope I get to fine something that works for me too.